Our March meeting went way too fast. Our committees met for the first time and it seemed to go well. We had one committee member, Nancy, who couldn’t stay but showed up just to attend her committee meeting. That was a show of dedication and neat to see. The Dart Frog Dash/5k walk/run at the Toledo Zoo on Saturday, May 14th. Proceeds go to The Toledo Zoo. The Humane Hustle/5k walk/run at Secor Metropark on Saturday, June 11th. Proceeds go to The Toledo Humane Society. Walk for Wildlife/1 mile walking route location TBA on Saturday, June 11th/proceeds go to Nature’s Nursery Wildlife Rehabilitation Center. Happy Trails/5k walk/run at Wildwood Metropark on June 18th or 19th. Proceeds go to Toledo area Metroparks. We looked into one large function which is the Susan G. Komen Race for the Cure, which is a 5k walk/run downtown Toledo on Sunday, September 25th. 60% of funds raised stay in NW Ohio and we could register as a team and have a team fundraising page. There are a few of us that will be attending each walk/run. If you would like to meet up with us and walk/run together, e-mail us at parrotsocietyofnwohio@gmail.com. These events are opportunities to establish the Parrot Society as a group that is interested in helping out other local organizations, and we can further get our name out there to others who may have an interest in parrots. The fourth weekend of April, there will be several of us meeting to attend the new parrot movie called Rio, from the same creators of Ice Age. We will also be meeting for dinner afterwards. E-mail us if you’d like to meet us. In the beginning of May we will be having a field excursion to Magee Marsh to attend and learn from The Biggest Week in American Birding. The Lake Erie shoreline in northwestern Ohio is widely recognized as one of the best birding areas in North America. Birders from all over the continent come here in May to see concentrations of warblers and other migratory songbirds. The Biggest Week in American Birding is an 11 day birding festival with a large variety of events going on – workshops, programs, speakers, guided nature tours, etc. Please see the link below to the event’s website where there is a calendar of events. Also note that some events are free, some events require registration, and others require a registration fee. If you would like to join us and participate in arranged car pooling, please e-mail us and indicate which events you would be interested in participating in. 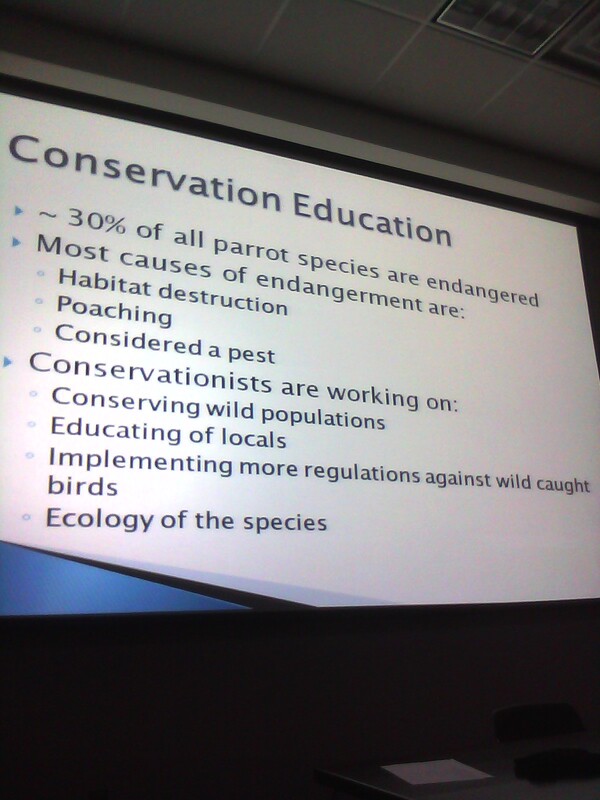 Conservation statistic shown on one of the slides of Kaitlin's presentation. Photo courtesy of Sarah Volk. 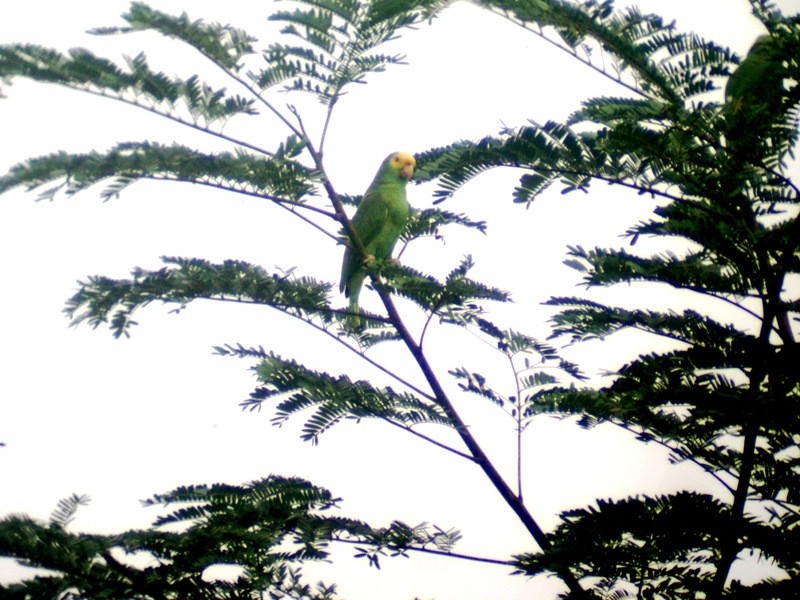 conservation of the Yellow- headed parrot. She began her presentation talking about endangered species and how many parrots are being poached currently. She focused on her work in Belize with the Yellow-headed parrot which started in 2006. During her work in Belize through Defiance College McMaster School for Advancing Humanity she authored a book titled “Leaving Wild” to help educate people in both Belize and the U.S. She still keeps in contact with people in Belize and is still working on conservation efforts for the Yellow-headed parrot. The link below shows current work from Emerging Wildlife Conservation Leaders that contacted Kaitlin in 2009 about her work with the Yellow-headed parrot.